A few weeks ago now, we were approached by Sock Ons to see if we would like to try out some of their products. Sock Ons are a revolutionary product that are designed to keep baby's socks on their feet. We have received two pairs of Sock Ons in green and orange to try out on the baby when she arrives at the beginning of next month so look out for my review on those! In addition to Sock Ons, they also sell Dribble Ons (bandana bibs), Plod Ons (baby knee protectors for crawling) and Mocc Ons. 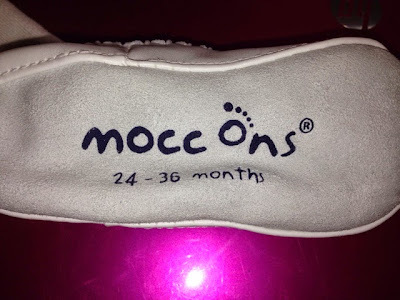 C was sent a pair of Mocc Ons to test out. 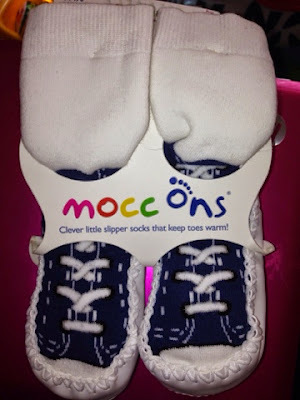 Mocc Ons are moccasin style slipper socks and they are available for children aged 6 months to 3 years. 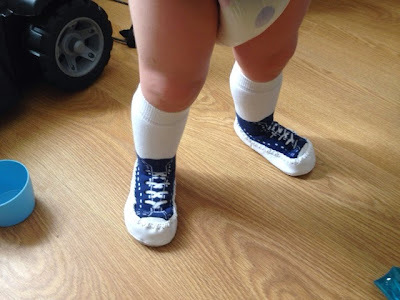 C is 23 months old and he received a gorgeous blue baseball boot-style pair in age 24-36 months so they are a little bit big on him but I'm happy that he will get plenty of wear out of them. C does run around the house in his bare feet but since receiving these, he's been wearing them non-stop! They are essentially a soft and stretchy cotton sock stitched to real leather sole. They seem to keep his feet warm and the leather sole ensures that he isn't sliding around on our living room floor and hurting himself. C has chunky legs so the top of the sock does leave a mark if he's in them too long. I love the design and they haven't lost their shape even after a few goes in the washing machine. He seems to really enjoy wearing them. He couldn't stop staring at his feet and stomping around the first time I put them on him. They must be comfortable as he seems to have no complaints! They are available in a wide range of designs and colours so you're sure to find something that you/your child will like! They are priced at £10.49 and are well worth the money, in my opinion. I tend to find that C can take his slippers off or they can fall off easily but this isn't the case with the Mocc Ons. They would make a lovely gift too! You can find a list of Mocc Ons stockists here and you can find out more on the website, Facebook and Twitter. 2 comments on "Mocc Ons - Review"
They look really sweet and so practical too.